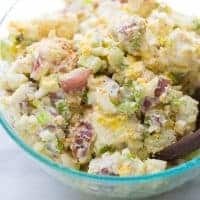 The BEST ever potato salad! Everyone always asks for this recipe. Such a crowd-pleaser! 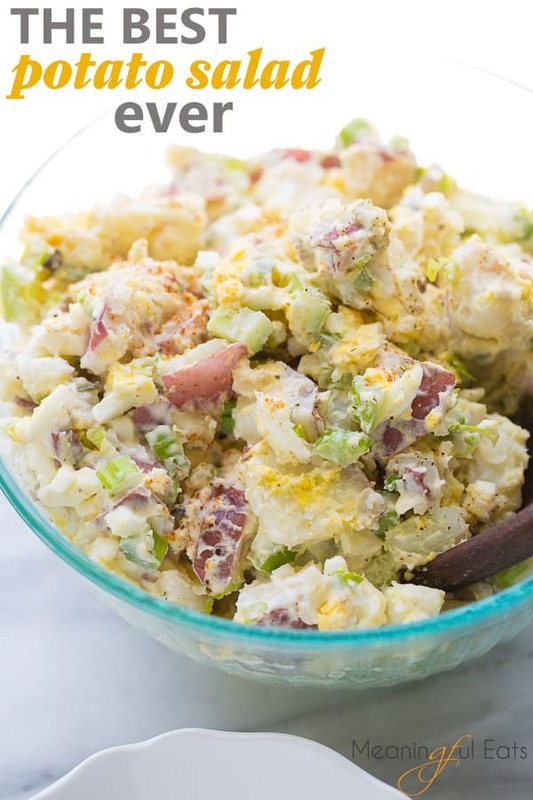 Potato salad is one of my absolute favorite things about summer! I love that so many summer BBQ dishes are naturally gluten-free. Give me a plate with baked beans, coleslaw, potato salad and watermelon and I’m a happy camper. This potato salad is my absolute favorite. I’m kind of known for this recipe in my family and besides cookies, it’s the number one thing everyone always asks me to bring to get togethers. This potato salad isn’t anything fancy! 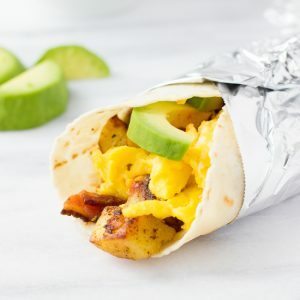 It’s just made with good, ingredients and has a few tricks for maximizing flavor. I like my potato salad classic – give me mayo dressing, hard boiled eggs and sweet pickles please! 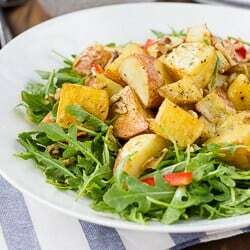 The trick that makes this potato salad extra delicious is mixing the warm potatoes with a vinegar/salt/sugar mixture. 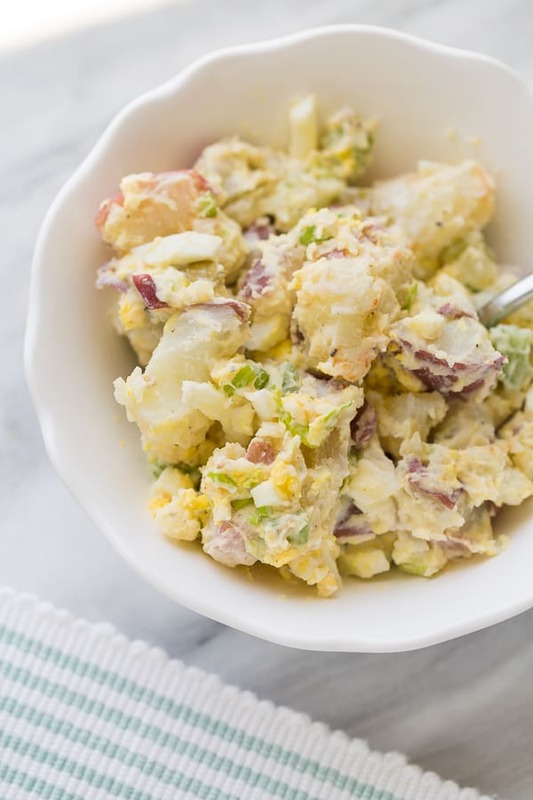 This helps the flavor to go inside the potatoes, making this potato salad extra flavorful! Also be sure to salt the water before boiling the potatoes. This is a small, but crucial step for flavorful potato salad. I like to fold in a mixture of mayo and sour cream (use all mayo to keep this dairy-free) as well as hard boiled eggs, crunchy celery, scallions and chopped sweet pickles. 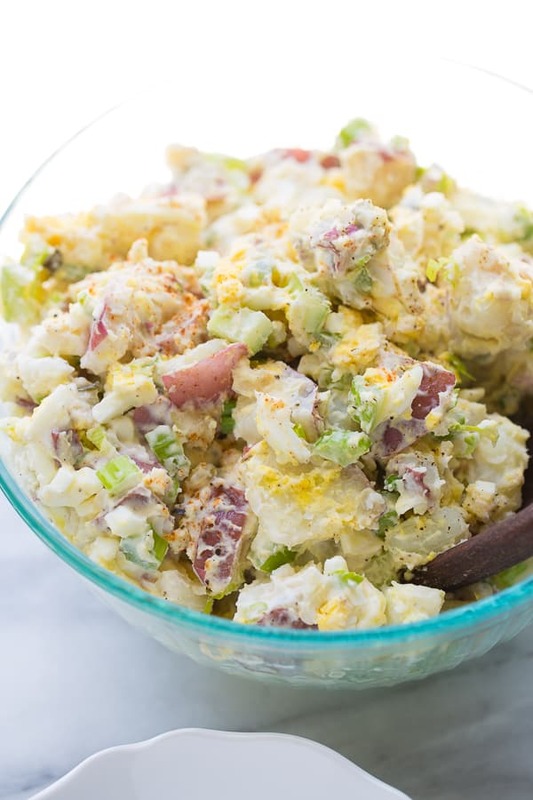 I usually make this potato salad 3-4 hours in advance (so it has time to meld flavors but doesn’t get soggy), but you can also make it the night before. Making homemade potato salad is a labor of love but totally worth the effort. 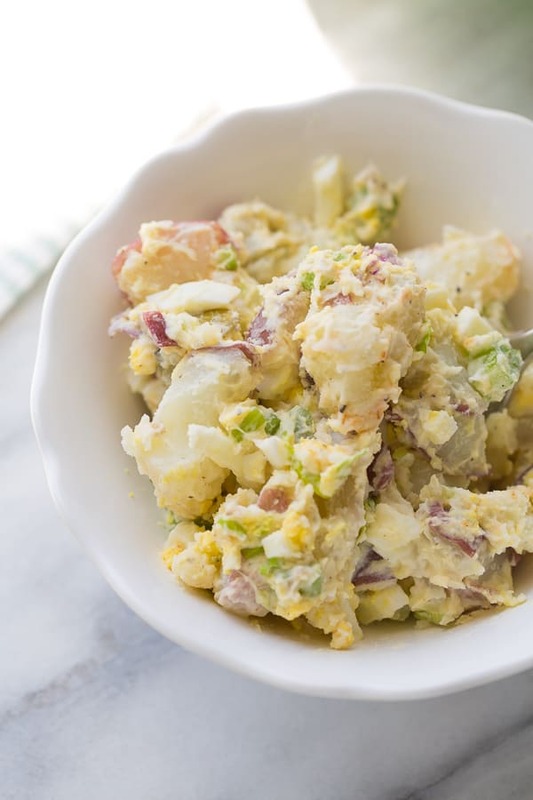 This potato salad is something worth making from scratch and is sure to be a crowd-pleaser! Happy summer BBQing! Bring a large pot of water to boil. Generously salt the water and add the cut potatoes. Boil until fork tender for about 15-20 minutes, checking every couple minutes towards the end of cooking. Drain the potatoes. In a large bowl, whisk together the white wine vinegar, salt, pepper and sugar. Pour the warm potatoes into the vinegar mixture and gently mix with a rubber spatula to combine. Whisk together the mayonnaise and sour cream. Pour over the potatoes and gently fold in. Add the remaining ingredients and gently stir to combine. Cover and refrigerate for at least 1 hour and up to 6 hours. Enjoy! MAKE-IT DAIRY-FREE: This potato salad also turns out delicious if you use additional mayonnaise in place of the sour cream. The trick that makes this potato salad extra delicious is mixing the warm potatoes with a vinegar/salt/sugar mixture. This helps the flavor to go inside the potatoes, making this potato salad extra flavorful! Also be sure to salt the water you cook the potatoes in. I like to make this potato salad 3-4 hours in advance (so it has time to meld flavors but doesn't get soggy), but you can also make it the night before. Was looking for a new potato salad recipe. Found this. Didn’t have green onions on hand so use some red onion. Never used the vinegar mixture or sour cream before. Other than the onion I made this the way you posted. This is so delicious! My husband loves it. Thank you for sharing. 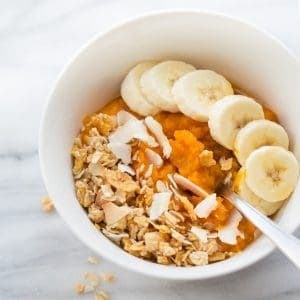 For sure, this is my new go to receipe! Thanks for the comment! I’m so glad you and your husband loved it! This looks amazing! Would it still be good without the sweet pickles? I can’t stand those.. In the recipe for Best Potatoe Salad Ever…. it calls for 2 1/2 pounds of red potatoes….not having a scale, approximately how many red potatoes are used? Very similar to what I make, and a little trick I do is to use pickled eggs instead of plain hard boiled eggs. Definitely kicks it up a notch! This was bar none, the best potato salad I’ve ever tasted. I used Costco bicolor baby potatoes and the dip in vinegar and small amount of sugar when drained taters are still hot, really gave it zing. Five stars folks. It’s a classic!!! Amazing! Just made this. Made slight adjustments to fulfill everyone’s needs in the house it is a definite do-over!